Antipodean Star was born at Cherwell Leys on Winter Solstice Day 2006. 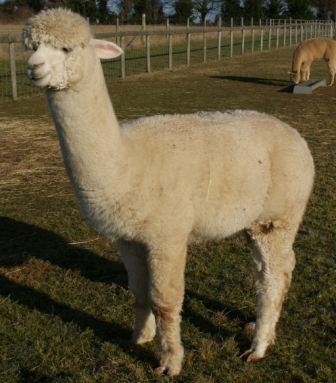 His Dam was selected from an import of Australian and New Zealand alpacas, she was already pregnant to impressive stud male, ILR Alpine Fibre's Brutus, himself a son of Rural Allianza Macusani Peruvian Hemingway a giant of an alpaca amongst the USA alpaca industry. Brutus has produced more champion alpacas than any other sire in New Zealand. With Mike Safley's NWA Ruffo and Jolimont Encantador on his Dams side, we were prepared for something very special, we were not disappointed. Star has excellent fleece coverage offering extreme density and fineness, the elite amongst fibre characteristics. When you part his fleece you can see very high amplitude, high frequency crimped staples. All of his desirable fleece qualitites are coupled with perfect conformation and good solid bone structure. Antipodean Star has started working and has females scanned pregnant already. If you are looking for excellent genetics with high quality pedigree Antipodean Star is available to book for matings On Farm or Drive By.